What better way to celebrate International Women’s Day than telling you a little about the Margaret McNamara Education Grants Charity, dedicated to empowering women through education throughout the world? If you find the charity’s name a bit of a mouthful, try MMEG for short. History Heroes brought out their WOMEN in HISTORY game in time for International Women’s Day last year. 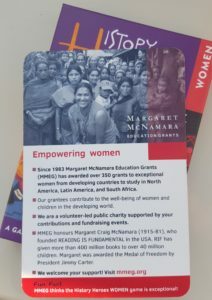 We then came across MMEG when they approached us about creating a dedicated card about their charity to put into our WOMEN in HISTORY card game. We immediately loved the charity and the idea. MMEG was set up and is supported by the World Bank in honour of Margaret McNamara. Margaret McNamara originally founded READING IS FUNDAMENTAL in the USA. That charity has given more than 400 million books to over 40 million disadvantaged children over the years to inspire them to read and learn. McNamara also worked tirelessly to raise awareness about the importance of education for children and women in developing countries. Margaret McNamara was married to Robert McNamara, one-time US Secretary of Defence and the 5th President of the World Bank. Margaret became a powerful advocate for women and children living in poverty. She was especially concerned that women and children not be overlooked in World Bank projects. She fought strongly for the education of girls and awareness of women and their needs in particular. President Jimmy Carter awarded her the prestigious Medal of Freedom in 1981 for her work, just before she died. In her honour, the Margaret McNamara Memorial Fund was set up and since 1983 over 350 education grants have been awarded to exceptional women from developing countries over the age of 26. The grants enable them to study in North America, Latin America and South Africa. A dedicated card about MMEG seemed to us a fantastic fit with our WOMEN in HISTORY game. History Heroes’ WOMEN in HISTORY is all about shouting from the rooftops about 40 of the most amazing women in history. How appropriate to include a card in the game about a fantastic charity, working to empower today’s women to achieve and reach for the sky too. So, the History Heroes MMEG card was born and included in a limited edition of our WOMEN in HISTORY games. Those games were then shipped off to Washington DC, where they are now spreading the word about History Heroes, amazing women in history and the equally amazing Margaret McNamara Education Grants. Here is the MMEG card in ‘the flesh’. 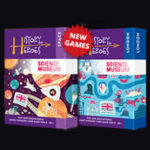 We have to admit we love their fun fact: ‘MMEG thinks the History Heroes WOMEN game is exceptional! We PROMISE we didn’t write it. Nor did we put them in a half nelson until they did either! Here too is what the card looked like, back and front: a perfect History Heroes WOMEN in History card. It gives us great pleasure to pay tribute to MMEG on International Women’s Day. If you want to learn more about MMEG or get involved in helping and/or supporting it, click here. The Best History resources: History Heroes is on the list!